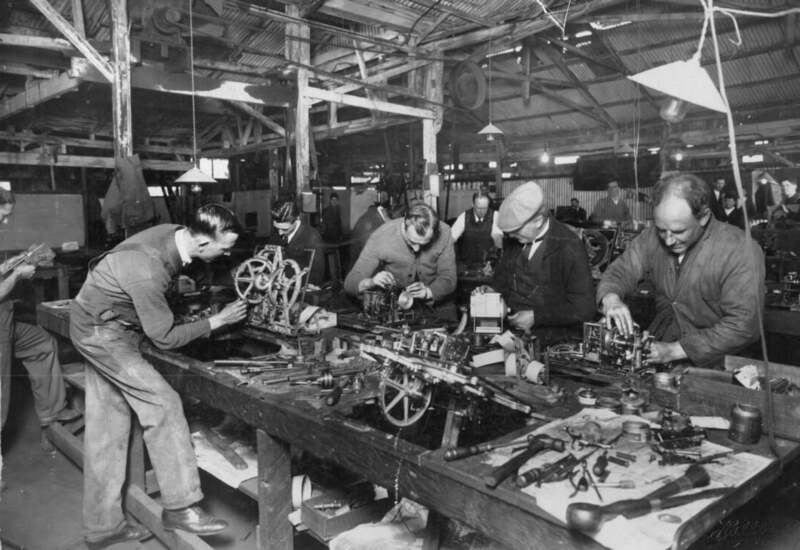 This history page contains a photograph, which is one of several belonging to the photo gallery pages, which are part of several pages relating to the invention of the world's first automatic totalizator in 1913 and Automatic Totalisators Limited, the Australian company founded by George Julius in 1917 to develop, manufacture and export these systems. This is the oldest Staff photograph I have and know of. 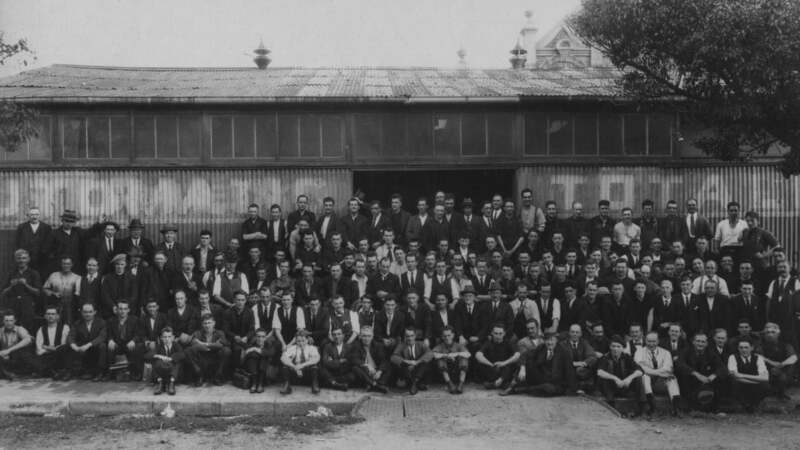 It shows the first of the Automatic Totalisators Limited factories, which was at Newtown Sydney located at 146-158 Alice Street. I have in my possession a letter of commendation for my wife's Auntie's father, written by the Works Manager of Automatic Totalisators Limited (ATL). on the 9th May 1921 and in this letter there is the Alice Street Newtown address. The surname of the Works Manager on this document is Setright although the initials are difficult to discern as it is a signature. I have read in a Trove archive copy of The Illawarra Mercury newspaper dated 11th March 1921, in an article with the title PICNIC - Metalliferous Employees Experience Wet Weather - , that Mr. H. R. Setright, who was one of the dignitaries attending the event, was the Works Manager for Automatic Totalisators Limited. He also worked on ticket issuing machine design with George Julius. Henry later left the company and moved to London where he became famous for his bus and tram ticketing machines in the U.K. and Europe. Henry Roy Setright could be in this image! If you arrived from navigating the website, use the navigation bar at the bottom of this page. Automatic Totalisators Ltd., a public Company was formed in 1917 to manufacture, install and operate Totalizators throughout the world. By 1970 with few exceptions, every major racing centre in the world used these Australian Totalizators, which were in service in 29 countries. The Automatic Totalizator was invented by the late Mr. George Julius (later Sir George). In 1913 he installed his first totalizator on Ellerslie Racecourse in N.Z. and the second at Gloucester Park in Western Australia in 1916. The installation at Ellerslie was the first automatic totalizator in the world and although it looked like a giant tangle of piano wires, pulleys and cast iron boxes and many racing officials predicted that it would not work, it was a great success. These early automatic totalizators were completely mechanical and consisted of Ticket Issuing Machines coupled to Drum Indicator Adder Units, all housed in the one building for one pool only. Miles of flexible wire cables connected the Ticket Issuing Machines to the Indicator/Adder Units. A considerable length of bicycle chain ran over sprockets and heavy cast iron weights were used for drive power. In 1917, after the Company was formed further research led to the introduction of electrical power and the miles of flexible wire cable were replaced by simple electrical conductors which operated solenoids both in the Ticket Issuing Machine and the Indicator/Adders. This was a major development because now the Ticket Issuing Machines no longer had to be close to the Indicators. By 1920 equipment was installed on a total of seven racetracks in Sydney, Brisbane and Newcastle in Australia, and Auckland in New Zealand. The equipment was very bulky , employing the principle of one Ticket Issuing Machine to one Escapement Wheel, which limited the number of Ticket Issuing Machines to the number of Escapement Wheels it was possible to build into the combined Adder Drum Indicator Unit. Invariably these installations were confined to one building and no attempt was made to connect buildings by underground cable. The Indicators provided for one Pool only, but the fields were large. For example, at Randwick, the equipment provided for 42 starters. At this stage all the equipment was manufactured at Mr. Julius' home in Darling Point, Sydney, or in a backyard garage nearby. Until the early 1920s the equipment was made for one Pool only and when you went on a racetrack you bet on the "Tote". The net Pool was divided up into three parts giving the winner 60 % and each of the 2nd and 3rd horses 20 %. At this stage there was a separate tote in each enclosure, not connected in any way with each other, so that, where three enclosures existed, as at Randwick, three different sets of dividends were declared. In 1922 the old single "Tote" was superseded when Win & Place pools were created and the same year the first Totalizator equipment for Win & Place betting was installed in Perth, Western Australia. From then on, with few exceptions, all racecourses installed Win & Place equipment. The Ticket Issuing Machines were divided so that some sold Win and others sold Place. The method of calculating the dividend for the Place pool was such that the total money invested on the placed horses was taken out of the net pool and the remainder was divided by the number of dividends to be declared and this figure was divided by the units bet on each placed horse. During the next ten years the Company installed equipment on 27 racecourses in India, Ceylon, Malaysia, Singapore, France, New Zealand and Canada. The biggest order during this period was equipment for Longchamp, Paris, in 1926, and this was the largest order undertaken by the Company until the order for Caracas, Venezuela in 1957, over 30 years later. Prior to 1927, only pool figures were displayed to the public but, in 1927, Mr. Julius came to light with automatic odds, which was probably the biggest milestone in the Company's existence. Models of this type of equipment were taken to London and North and South America. In 1930, Automatic Odds Equipment was installed at Harringay Dog Track in London, and the following year Automatic Odds Barometer Indicators were installed at Flemington, Caulfield, Moonee Valley and at Williamstown Racecourses in Victoria, Australia. Well that sets the scene regarding company history and the state of the totalisator industry covering the period of this factory. Now lets travel forward a century from the founding of the company in 1917 to the present 2017 when much of this web-page is being developed. In December 2015, Narelle and I visited the State Library of New South Wales and looked at their comprehensive set of Sydney Telephone Books on Microfiche spanning 1889 to 1950. This revealed that Automatic Totalisators Limited had the factory at Newtown starting in 1919, with the last phone book entry for Newtown being in November 1933. The May 1934 Phone Book entry shows the factory at 182 Chalmers Street, with a depot in Central Street in the city and an office at Randwick Racecourse. The phone book entries for Automatic Totalisators Limited start in 1917, the year the company was founded, with an address of 4 Bridge Street, with the same entry for 1918. The company Totalling Mechanisms Limited was in existence in 1914 and seems to be the forerunner of Automatic Totalisators Limited. I have read in a Trove archive article from The Sydney Morning Herald dated Friday 4 November 1927, that Automatic Totalisators Ltd took over the obligations of Totalling Mechanisms Ltd in April 1917 and that Totalling Mechanisms Ltd was dissolved in 1919. Judging from the painted name on the side of this building, the name Automatic Totalisators is painted over some other name, probably the previous tenants, possibly Totalling Mechanisms Ltd. Although the phone book entries for this factory only started in 1919, the factory existed prior to this, as a Trove newspaper archive article from The Sun newspaper dated 27 September 1917, titled RANDWICK TOTALISATOR with a subtitle Inspected by Mr. Fuller , states that all of the 1917 Julius Totalisator for Randwick Racecourse was made in this Alice Street Newtown factory. This article also states the system was electrically controlled, stop and start betting by the flick of a switch in the Stewards Room. As indicated above the telephone number for Automatic Totalisators Limited at this factory started in 1919 yet the factory existed at least two years prior. Automatic Totalisators Limited, also mentioned above, had a phone number in the 1917 and 1918 phone books, for an office in Bridge Street. Consequently, I deduce that this factory operated without a telephone until 1919. There must have been some other form of communication between the Bridge St. office and the Newtown factory. The 1917 Randwick system mentioned above, was the fourth of the Julius Tote installations and had 150 terminals that catered for a field size of 42. It was the first of the electromechanical Julius Totes and was in my opinion the world's first large scale, on line, real time, multi user system. It would not have been thought of as such at the time however, as it took decades for the advent of digital computers to arrive that made these concepts commonplace. This system must have created a significant bond between the AJC (Australian Jockey Club) and ATL (Automatic Totalisators Limited). The 1934 phone book mentioned previously indicated ATL had an office at Randwick racecourse, the year before the opening of the next generation Julius Tote at Randwick which would have been another major project. The number of jackets and ties being worn in the image above is amazing by modern day standards. It is curious that they have not bothered to paint over the previous writing on the corrugated iron walls to create a clean slate on which to paint Automatic Totalisators. No doubt the higher priority jobs like the Randwick project were very pressing! The old foto in front of the Newtown factory is always interesting to me. I do not know when my father started work. It may have been at age 14 (born January, 1911) as he was thrown out of Cleveland Boys High School for hitting one of his teachers after the teacher had hit him! He was always ahead with his technical drawing which he always loved. He asked his teachers for more work at times and was always told wait until the other boys catch up. The young boy sitting in the front row with the tie may be my father? Next to him may be Joe Norris? But I am sure Joe started after my father. Bill's parents were very strict in their ways and may have sent him to work well dressed as an apprentice! Funny thing as I recall my first day at totes I was overdressed in my good clothes. William Johnson Jr. mentions in the quote above that his father attended Cleveland Boys High School, which I take to be Cleveland Street Public School. I find it ironic that when the Automatic Totalisators Limited factory moved from Newtown into the city centre at Chalmers Street, William Johnson Sr. was working across the road from where he went to school. According to Wikipedia, the school was founded in 1856 and is one of the oldest public schools in Australia still operating on its site. The Wikipedia reference is: Page name: Cleveland Street Intensive English High School Author: Wikipedia contributors Publisher: Wikipedia, The Free Encyclopedia. Date retrieved: 21 February 2017 23:55 UTC Permanent link: https://en.wikipedia.org/w/index.php?title=Cleveland_Street_Intensive_English_High_School&oldid=725399198 Page Version ID: 725399198. I visited the location of the Newtown factory at 146-158 Alice Street in September 2014, after Diane McCarthy who is the treasurer of the Marrickville Heritage Society and has done some research on the location of the early Automatic Totalisators Limited factories in Sydney, informed me of the address. As Diane had described, these street numbers are now occupied by a modern gated community of town houses with a street address of 146 Alice Street. I had no misgivings regarding the fact that there would be no trace of this old corrugated iron shed-like building in the 21st century, however I did think that the ornate stone building peering above the roof-line of this factory in the image above, may have stood some chance of surviving. I had a good look for any sign of a similar building but found no trace of it! I had trouble envisaging where the factory stood, as there were groups of terrace houses on either side of the factory address of 146-158 Alice Street which between 144 and 160 only left a relatively narrow frontage onto Alice Street. This continued to trouble me until April 2018 when I received an email from Barbara Ainsworth, curator at the Monash Museum of Computing History. She replied after I sent her a totalisator history website update in which I appealed for information from anyone who might have any ideas on positively identifying the image at the top of this page as the ATL Alice Street factory. She suggested that someone at the Newtown History Project might be able to help, a project I was unaware of. I quickly found the Newtown Project on the Internet and I was surprised by the quick response from Naomi Crago, an archivist at the City of Sydney archives. She sent me two links, one to an aerial photograph of the site in 1949 titled City of Sydney - Aerial Photographic Survey, 1949 Map 102 and is from the Historical Atlas of Sydney. My expectation prior to opening the link was that by 1949 this site would already be residential. I was flabbergasted to find a substantial factory building still on that site, which appeared much larger than how I imagined the Alice Street factory would have been. I deduced that the factory building had changed considerably since the photo shown at the top of this page was taken. Although the roof of the major section of the 1949 factory consisted of what looks like from above, two very long thin neighbouring structures with A-frame roofs and the factory image above also has an A-frame roof although it is not possible to know if there is a second roof behind it, the marking on top of the roofs in the aerial photograph do not match up with what appear to be ventilators on the apex the roof of the factory in the image at the top of this page. In contrast the 1949 aerial photo shows what appear to be two rows of skylight windows in each of the long narrow section A-frame roofs along each side of the apex of the roof of the factory. It did however immediately answer how the original factory was oriented on the site. As shown in the image above which I extracted from the 1949 aerial photo is on a block surrounded by a rectangle of streets. The near horizontal diagonal street that runs off the top of the photo with trees on both sides is Alice street and the parallel street below the factory is Laura street. The street to the left of the factory intersecting Alice and Laura streets, is Edgeware road and the parallel street to the right of the factory is Hawken street. It is obvious that only the ends of the two very long thin neighbouring structures with A-frame roofs front onto Alice Street. The factory was oriented 90 degrees turned around from how I had envisaged it aligned with Alice street and suddenly the site made a lot more sense. I had not realised how deep the block of land is. The 1949 factory extends three quarters of the way from Alice street to the next parallel street, Laura street. This 1949 aerial photo shows the block widens out, more than doubling its width about mid way down the two A-framed roof sections of the factory from Alice street. At this point the 1949 factory has, what looks like from above, four parallel close together and perpendicular extensions to the main body of the factory, extending in the direction of Hawken Street. This gives the factory an L shape outline when seen from above. Although this looks like four individual extensions, the dark lines that appear between these apparent extensions could be shadows, created by a sawtooth roof from the pinnacles of the sawtooth where the roof rapidly drops to the height where the following ramp starts up to the next pinnacle. 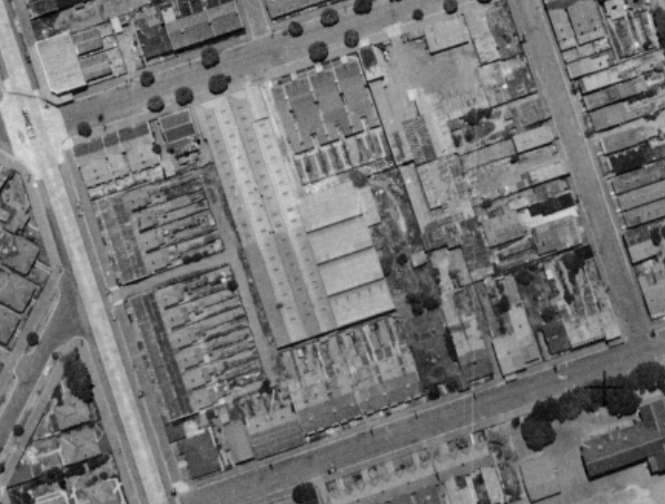 The 1949 aerial view of this factory is a monochrome image, however it is clear that a section of the part of this factory that consists of the two very long thin neighbouring structures nearest Alice Street, is a much lighter shade of grey or a different colour to the remainder. This lighter section is a little over half the length of this long part of the factory. The joins between these differing shades of grey sections of roof are a straight line across both roofs which almost lines up with the apparent division between the first and second perpendicular extensions. I speculated that this might be a partially completed paint job on the roof or could have been a join where an original structure already stood and was extended. If the latter is true could the original structure have been a remnant of the ATL factory? It did not take long to realise that a significant characteristic of this factory, as seen in the aerial photo from the outside, was evident in other photos belonging to the Alice Street factory section of the Photo Gallery on this website, from the inside. A couple of these photos are images taken inside one of the perpendicular extensions of the long thin part of the factory looking into the long thin part. Both photos show that the extension section does indeed have a sawtooth roof as speculated, with one showing it very clearly. Other photos are clearly taken inside the long thin part. The skylight windows are visible in some of them. It became apparent from the photos that the ATL factory fit well into the factory seen in the aerial view above and would have occupied a lot if not all of it. I had no idea totalisator manufacture was on such a large scale so early. Of course the factory probably grew during ATL's tenure there. Out of curiosity I was interested in the type of companies that occupied this site after Automatic Totalisators Limited. Naomi sent me links to two maps City of Sydney - Building Surveyor's Detail Sheets, 1949-1972 Maps 18 and 22 as the factory straddles these two maps, the former covering Marrickville and the latter St. Peters. The maps which are circa 1956 show the factory partitioned and shared by the following three companies starting at the Alice street end and moving towards Laura street: King Gee Clothing Co. Pty. Ltd., Felt & Textiles Of Aust. Ltd. and Rebuilt Electrics. Naomi also informed me that there is no copyright issue with my presenting the above image extract from the 1949 aerial photograph. Armed with this 1949 aerial view of the factory site it was interesting to compare it to the present satellite view of this block, as it is amazing how the 1949 aerial view of the factory lines up with the present day town houses. The present entrance driveway to the gated community town houses from Alice street passes through the gate with 146 marked on the right hand pillar and passes a long row of town houses on the right hand side. These approximately sit on the ground which was occupied by the two long parallel building sections of the factory. About half way down this row of town houses on the right, a second row of town houses begin on the left hand side. This second row occupy the ground where the four extensions to the main factory building once stood. With this knowledge of where the factory stood I can dispel the erroneous early belief that the building peering over the factory in the image at the top of this page was probably on the near or far side of a street. Now knowing the orientation of the factory, it is clear that it is nowhere near the two possibilities Edgeware road or Hawken street, so it is probably standing on ground associated with the factory. This has strengthened my belief that the factory, part of which is seen in the image at the top of this page, once stood on this site. The factory building in the image at the top of this page probably sat on part of the ground that later was occupied by the two long parallel sections of the 1949 factory. The second document which Naomi sent me, a link to the Sands Directories, indicated that Automatic Totalisators Limited occupied this site in 1918. Whilst on this page I looked up the most recent Sands Directory on that site which was for 1932 and that confirmed Automatic Totalisators Limited still occupied the site that year. This is in keeping with the information extracted from old phone books mentioned previously. I was interested in the pictures of the old factory at Newtown and your descriptions of it, and thought I would let you know about a very interesting website I recently came across which you might also be interested in. It's a NSW mapping site, and it provides aerial views of Sydney (or more correctly of NSW), both from recent times and also from circa 1943. I've checked out the Alice St, Newtown factory site, and it looks to be much the same as the 1949 image on your website. The ATL Meadowbank site is shown as vacant land in 1943. In August 2018, after attending a 50th year school reunion in Double Bay Sydney, Narelle and I moved into a hotel in Chalmers street in the city. Double Bay was nostalgic as I had gone to school in the area, George Julius lived at nearby Darling Point and earlier in Ocean Street and the nearby Opera House, where I worked during its construction, the place where I first became aware of Sir George Julius and his company Julius Poole and Gibson. Chalmers street was also nostalgic as the hotel was only a few blocks from the ex Automatic Totalisators Limited factory in Chalmers street, which was still standing and not far from the Alice street Newtown factory site. Having had a good look over the Chalmers street factory building, I was satisfied that there was no evidence of the large archways present in some photos considered to be at the Alice Street factory, confirming these photographs were not taken at the Chamlers street factory but are indeed of the Alice Street Factory. Additionally, whilst staying at the hotel in Chalmers street, I had a thorough look at the Alice street factory site. I have now walked up and down the whole length of the factory site along the present day town-house driveway which approximately occupies the area covered by the right hand of the two long narrow factory buildings in the Alice Street Factory aerial view image above. I spoke with a woman who is a resident and was exiting her garage with her bicycle. She informed me that she was aware that the site had been occupied by factory buildings. I also walked down the alleyway between the terrace houses on Edgeware road towards the factory site. Edgeware road is the major road seen on the aerial view image above running from the bottom of the image left of centre, running parallel to the long factory buildings and off the top left corner of the image. This alleyway comes to a T intersection where the top of the T runs parallel along the left hand side of the left hand long narrow building segment of the factory as seen in the aerial image above. This section of the alley is approximately fifteen feet below the level of the base of the town-house block now sitting on this site. Presumably this drop also existed when the factory stood there as well. Looking up, the whole side of this town-house block is visible. The alley provides access to garages for the terrace houses. After close examination of this factory site, I am satisfied that there is no remnant of the factory era remaining and that any future investigation into this factory site will have to be focused on searching for historic documents and images in the libraries. There is certainly no evidence of the building peering over the factory in the image at the top of this page. Narelle and I had a very pleasant lunch at the Wolf and Honeybee Cafe on the corner of Alice street and Edgeware road. This factory is where the earliest manufacturing of Automatic Totalisators Limited took place. The Premier Ticket Issuer which is mentioned below, was one of the early TIMs (Ticket Issuing Machines) produced here. The early electromechanical totalisator central processing systems were also manufactured here. We have already had an example of this as the complete 1917 Randwick Julius Tote was manufactured here. Additionally there is an example of later central processing system manufacture being performed in this factory in the next image. It shows the Adders, which are part of the central processing system, for the Longchamps totalisator in France being assembled. Regarding manufacturing being performed at home or in a backyard garage, this principle already had a prior precedent. I have long been communicating with Tim Vickridge in Western Australia. His family home in Fremantle where he grew up, had belonged to George Julius and his wife Eva before they moved to Sydney. Tim's mother had told him that her mother had told her that Lady Julius had said that George would tinker for hours out in the backyard working on a contraption with belts and pulleys. In other words George had been tinkering on the tote at home before even moving to Sydney where this history really began to take off. Tim is also aware of C.Y. O'Connor, the father of George's wife Eva and another prominent Australian Engineer, as C.Y. O'Connor supposedly lived in the house before his daughter and George Julius bought it. One last observation relating to this early automatic totalisator manufacturing, is that the second quote below from Rudolph Wilkinson, indicates that the Premier Ticket Issuer company had a small factory in Wilmot Street Sydney although no Ticket Issuer manufacture took place there. Linotype for the Premier Ticket Issuing Machine print heads was manufactured in this factory. Other than Rudolph's mention of it, I have never heard or read anything else about this factory and consequently have nothing more to add. The earliest prominent manager of Automatic Totalisators Limited was Frederick Augustus Wilkinson and his tenure covered the period of this factory at Alice Street and the following one in Chalmers street in the Sydney CBD. He had a strong background in engineering and started out as a design engineer. George Julius and he designed an electromechanical ticket issuing machine together, to be used with Julius tote systems. Frederick worked for Automatic Totalisators Limited for three decades and became the State Tote Manager. He worked closely with George and travelled widely for the company. The following comments were written by Rudolph F. Wilkinson, son of Frederick Augustus Wilkinson. About 1916, the tote was installed at Randwick Racecourse and what a runaway success. FW was Course Manager until he retired about 1952 except when he was overseas at India, Java, Canada, France, UK, and South Africa on sales promotions with George Julius. FW addressed the House of Commons in the UK. The auto tote was installed in racecourses in France, notably Longchamp. FW lived in Paris for 4 1/2 years during which time he married Dorothy Watt. He and Dorothy, with their infant daughter Patricia, returned to Australia in 1928. Rudolph mentions Frederick Wilkinson being the Course Manager for Randwick. As the Automatic Totalisators Limited Totalisator Manager the Randwick totalisator was Frederick's responsibility. As mentioned above, Automatic Totalisators Limited had an office at Randwick Racecourse, where Frederick probably spent a lot of time. Frederick could be in the image at the top of this page. I have also read the following, the source of which is unclear but is contained in the same document as the quotes from Rudolph Wilkinson: Mr. George Julius, the inventor of the machine, and the manager, Mr. Fred Wilkinson, attended a meeting of Members of Parliament in the House of Commons and also spoke to the House. Below is a 1925 Referee newspaper article titled OFF TO INDIA which records Frederick's trip to Bombay with Automatic Totalisators Limited, extracted from the National Library of Australia's Trove newspaper archive on the Internet. It is interesting to note that the Randwick system mentioned by Rudolph above, was the largest totalisator in the world in 1917 with 150 terminals. With the installation of the Julius Tote in Bombay with 126 terminals in 1925, as referred to in the following article, the Randwick system was still larger. When another fifty terminals were added the following year, the Bombay system became the largest totalisator in the world. Rudolph also mentions the Longchamps system above, a project which Frederick spent four and a half years working on in Paris. With 273 terminals the Longchamps system became the largest totalisator in the world, taking the title from the Bombay system. Mr. F. A. Wilkinson, manager of the Automatic Totalisator Ltd., leaves for India to-day. His trip is for the purpose of supervising the completion of the Totalisators which are being installed at Bombay. It surprises me that the Automatic Tote's machines have not been adopted in France. Totalisator arrangements at Longchamps, where the Grand Prix is run, are very poor by comparison with those of Randwick. It is interesting that the writer of the above article speculates that an Automatic Totalisators Limited system should be installed in France as that came to fruition in 1928. Rudolph Wilkinson has already indicated above that Frederick lived in Paris for 4 1/2 years working on that project. A dinner was held at the Australia Hotel Sydney for Frederick Wilkinson and his daughter before they left for France on 27 January 1927. The dinner was attended by a lot of Sydneyites. Presentations were made by Doggie Wallis. One speaker raised a controversy regarding which was the greatest industry in America. Some said it was the steel industry, others motion pictures. However there was no doubt that Frederick Wilkinson was going to France as a representative of Australia's greatest industry, horse racing. The following Trove archive, Newcastle Morning Herald and Miners' Advocate article, demonstrates the significance of the French contract for Australia, the largest Austral-French commercial transaction. The assembly work in the photo above is being done for Longchamps racecourse that is part of this project. Universal Automatic Totalisators, Limited, Sydney, has contracted to instal at Longchamps totalisator machines of the type used in Sydney. At first they will be operated by Australians to allow of a French staff being trained. This, together with the contract signed by Mr. Bethell on behalf of the same company last month to instal totalisators at 16 French racecourses is the largest Austral-French commercial transaction yet effected. The French order meant considerable design work, as now, for the first time, the Adders were to be divorced from the Indicators. The Adders had to have a capacity of a minimum of 273 Ticket Issuing Machines through a Distributor connected to one Escapement Wheel, over 35 Escapement Wheels where needed on each Adder. The Adder design was a feat of mechanical engineering, all values and transfers being mechanically linked. The Ticket Issuing Machine design also was a remarkable piece of engineering and saw the introduction of a machine to sell both Win & Place tickets from the one machine. This was a big step forward and proved to be one of the main features for many years to come. The equipment for Longchamp was manufactured in the factory at Alice Street, Newtown, N.S.W. except for the Ticket Issuing Machines, which were made in Paris under supervision. Regarding the above comment the Ticket Issuing Machine design also was a remarkable piece of engineering, these TIMs can be seen being manufactured in the image below titled Assembly of Julius Tote TIMs. Following is a 1950 Newcastle Morning Herald and Miners' Advocate article recording the appointment of Alf Boa as State Tote Manager of Automatic Totalisators Ltd, who is taking over from Frederick Wilkinson. Mr. A. A. Boa, of Newcastle, has been appointed tote manager of Automatic Totalisators Ltd. in New South Wales. He will succeed Mr. F. Wilkinson, who has been manager for 30 years. The appointment will take effect from December 1. Mr. Boa has been given the right to retain his accountancy practice as principal of the firm of Lamb and Boa. Before receiving the appointment he had arranged to leave for England on August 19. He did not intend to return till early in the New Year, but will be back in time to take up his position with Mr. Wilkinson for the December and January metropolitan race meetings. While abroad, Mr. Boa will gain experience in tote management in the United Kingdom and on the main courses in France, where tote machines are operated by Automatic Totalisators Ltd.
On the way he will fly from Panama to Randall Park (U.S.A.),where the company has installed a machine, which will be operated for the first time on July 19. Mr. Boa was appointed manager of the new automatic tote at Broadmeadow by the company this year, but he succeeded Mr. Norman Lloyd in the management of the tote at Newcastle many years ago. He has been "schooled" in tote management by his father, Mr. John Boa, superintendent of the totes at Newcastle Jockey Club's horse and greyhound meetings, since he was 16. Mr. Boa sen. will assume the management of both totes with another son, Mr. W. D. Boa. Mr. Boa was also once secretary of Boolaroo Jockey Club. succeeding Mr. J. Grisdale, jun. In the above article Frederick Wilkinson is shown to have an impressive tenure of 30 years with Automatic Totalisators Limited. This means he would have seen the factory move from Newtown to the city in Chalmers street. As the above article was written in 1950, Frederick would also have seen the final move to the Meadowbank factory as well. Mr A. Boa went on to become the General Manager of Automatic Totalisators Limited taking over from Spencer Grace. I noticed under the heading See U.S. Machine that Mr A.A.Boa will fly from Panama to RANDALL PARK which operated for the first time on July 19. This must have been 1950 as we worked on the Randall Park job in the factory as a matter of urgency, during the Xmas/New year period, to have the machine finished in time for the Randall Park Carnival racing period. From memory we worked a lot of overtime to get the job finished and I believe air freight was involved. I think Alan Lakeman and Jim Macintyre were just two of the Meadowbank engineers that worked on the installation at Randall Park. Frederick Wilkinson's grandson, Murray Irwin contacted me many years ago regarding Frederick Wilkinson. At the time I had not heard of Frederick. Murray sent me the first page of an Australian patent submitted by George Julius and Frederick Wilkinson for a Ticket Issuing Machine. The emblem on the document reads Department of Patents - Patents Act 1903-1909 - Commonwealth of Australia. The number is 4055/17 and the application is dated 21st May 1917. It also indicates the complete specification was accepted on 21st August 1918 and the acceptance was advertised in September 1918. Rudolph Wilkinson wrote that these machines were called the Premier Ticket Issuer and that they were manufactured in the Automatic Totalisators Limited factory at Alice St. Newtown shown in the image at the top of this page. Independently, Murray's brother Richard Irwin contacted me through this website in May 2013 as did Murray years earlier. I learned more about Frederick Wilkinson and Richard informed me of the American patent document referred to next. Before I move on, I have so many coincidences with totalisator history, that I have a section on this synchronicity on this website. Richard presented a coincidence in that he works in Gordon in Sydney which is where I used to live. Additionally when I lived in Gordon, prior to having any knowledge of totalisators let alone their history, I practically drove past the house where Frank Matthews grew up, almost every day for ten years. Frank was the last senior partner of George Julius' engineering consulting company Julius Poole and Gibson. Having mentioned Frank, the image at the top of this page is one of a large group of photographs he gave me which came from Julius Poole and Gibson. Following is an image of the first page of eighteen, of a United States patent US1288910 (A) - 1918-12-24 courtesy of The United States Patent and Trademark Office. 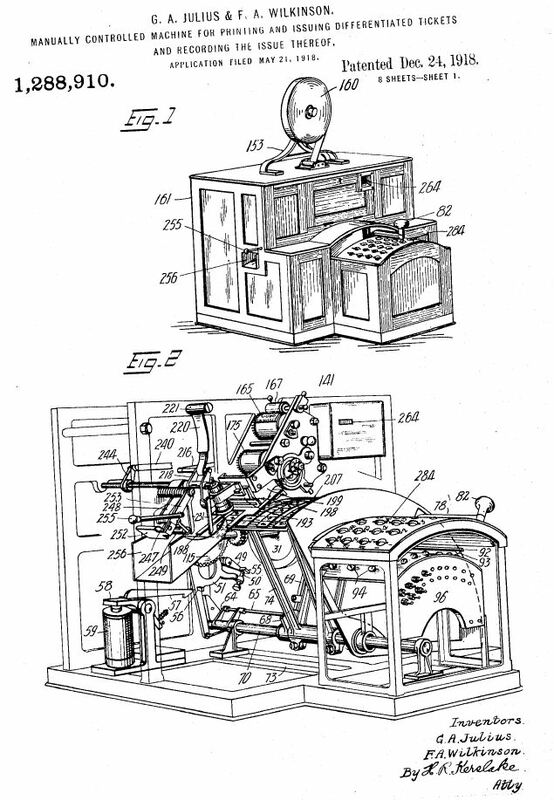 This patent is for the same machine in the Australian patent document mentioned above by Murray Irwin, which as Rudolph Wilkinson identified above was called the Premier Ticket Issuer. The patent shows George and Frederick had a close association early in the history of Automatic Totalisators Limited. This patent is dated 24 December 1918 and George's first totalisator which was purely mechanical commenced operation in 1913. I suspect that George and Frederick designed this ticket issuing machine together when the Julius Totalisators became electromechanical. Having mentioned electromechanical, there is an electrical component clearly visible in the patent drawing below shown in Fig.2. It is a solenoid, the tall cylindrical component shown in the lower left corner of the Premier Ticket Issuer. FW owned the Premier Ticket Issuer Company and it was a small building in Wilmot Street, a lane really joining George and Pitt Streets, above the Central Court. This small factory never manufactured the ticket issuer. This was done at Automatic Totalisators factory at Alice Street, Newtown. For fear of forgeries, special copper-plated type was made for each race and different coloured paper rolls were also used for each race. Only one attempt was made by rubbing out a number. This was so clumsy that the forgers were easily apprehended. Only one or two men were employed at Wilmot Street and they made the lead baked types (Linotype). The first auto tote was tried out in a church hall at St. Peters. I feel sure the year was 1913 or 1914. As it has been recorded in a company document that the Julius totalisators became electromechanical in 1917, I think the Premier Ticket Issuer in the patent page shown above is the first Automatic Totalisators Limited Ticket Issuing Machine (TIM) to incorporate electrical elements and hence is an example of the paradigm shift in totalisator design from purely mechanical to electromechanical. TIM is the more modern and generic term for what in the Patent Document is called the Premier Ticket Issuer. The complete patent document mentioned above can be read in the Automatic Totalisators in America chapter of this website. To read this, select the Go to the index button in the Navigation Bar below and select the mentioned chapter in the index. Finally scroll down to the title A US Patent G.A.Julius & F.A.Wilkinson 1918. 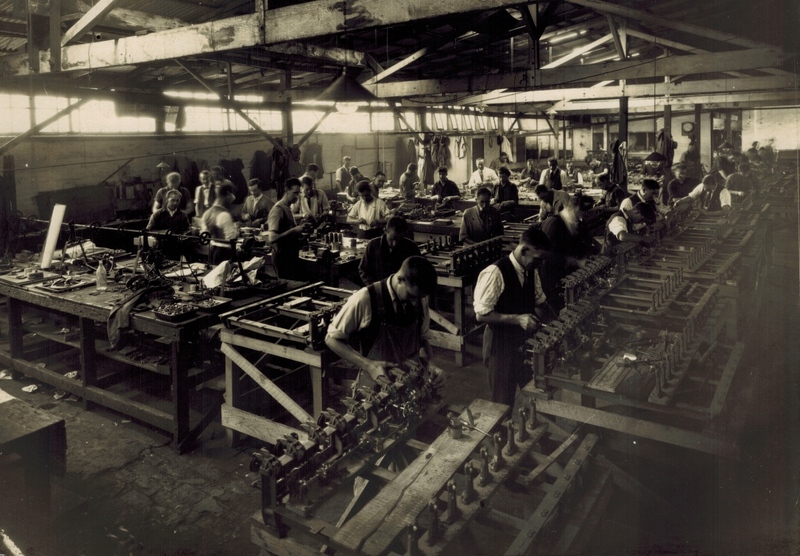 On the subject of TIMs, above is an image showing the assembly section for Ticket Issuing Machines at the Alice Street Newtown Factory. Judging by certain characteristics of the machines being assembled I believe these are J5 Tims. Although the J5s were used for the Longchamps project mentioned above, the Longchamps J5s were manufactured under supervision in Paris. Either the machines in this image were a few machines for local testing of the Longchamps adders seen being assembled in the image above titled Assembly of Julius Tote Adders for Longchamps , or they are being assembled for another project. If they are testing TIMs being built, they would also be used for testing other parts of the Julius tote as well. If they were for Longchamps then this image and the one showing Adder Assembly for Longchamps were probably taken at the same time. I think the photo of the Longchamps adders being manufactured was probably taken in 1926 or 1927. If the image above, of the J5 TIMs being assembled was not taken at the same time, I surmise it was taken some time in the mid to late 1920s. A full sized version of the image above can be seen in the Photo Gallery of this website. To view this click on the image at the top of the page and select the thumbnail of the above image with associated text starting An early workshop photograph... . This chapter has focused on the earliest manufacturing of George Julius' company Automatic Totalisators Limited, which took place at this Alice St. Newtown factory. As the first system that I know of that was manufactured at this factory, was the 1917 Julius Tote for Randwick, it leaves me with the obvious question where were the first three Julius Totes manufactured. The first three Julius Totes actually pre-dated Automatic Totalisators Limited and must have been constructed by Totalling Mechanisms Limited, the forerunner of Automatic Totalisators Limited. The image above, that is provided courtesy of Tony Shellshear George Julius' great grandson, shows the first Julius Tote which commenced operation in 1913, being partially assembled in a substantial shed like facility. Presumably this first assembly was to ensure the design was functional and provide an opportunity to make changes as well as test that everything worked to specifications prior to delivery. The above image is not inside the tote house at Ellerslie Racecourse where it was eventually installed for the customer The Auckland Racing Club, where the conditions were cramped. The only reference to the earliest Julius Tote manufacturing is quoted above from a company document which I think was written by Don Hardie, an earlier Automatic Totalisators Engineer than any I know, which states at this stage all the equipment was manufactured at Mr. Julius' home in Darling Point, Sydney, or in a backyard garage nearby . This quote, extracted from part of a company document presented above prompts me to mention that I do not think this quote should belong in a paragraph beginning with By 1920 , as we have proof that the much earlier 1917 Randwick system was already manufactured in the Newtown factory. Furthermore, I think it would have been difficult to manufacture the whole of the 1913 Auckland Racing Club, Ellerslie system shown in the image above, or the 1916 West Australian Trotting Association, Gloucester Park system or the 1917 Queensland Turf Club, Eagle Farm system in a garage! Additionally, the image above does not give the impression that it is in any Garage but something much larger and substantial and more likely to be suitable as a bus terminus shed. I sometimes think about the early days of ATL and what the factory arrangements must have been like, to manufacture what appears to be a lot of castings and machining of the various parts, I think it would have taken a lot more than a garage in the backyard. I agree with you, unless the garage nearby was huge, there would be no way to pre assemble and test the Ellerslie tote before shipment, let alone the other machines even done one at a time, the photos from Tony Shellshear would indicate the assembly was carried out in a very large building. I used to work at Ulco Engineering, in the early 1980's it was then in King St Newtown , not far from Alice St. Last time I was there, things had changed so much I did not recognise it, I suppose the same with Alice St. next time I am down there, I will take the time to look around and see what turns up. I find Bob's reference to Newtown very interesting. I was disappointed that I could not find any trace of the location where the photo shown at the top of this page was taken, when I visited Alice St. Newtown in 2015 as described in one of the paragraphs below the photo. After reading Bob's experience, I now realise how futile my hope of even finding the slightest trace in 2015, of something connected to the image at the top of this page which was most probably taken in the 1920s, when Bob did not recognise anything at a location in the vicinity of this Newtown factory when returning to have a look after having worked there in the 1980s. Having speculated where the first three Julius Totes were manufactured, now after just having added the extract from the 1949 aerial survey photograph showing this factory in the image above titled Aerial View Alice Street factory post ATL , I noticed that in the image above of the Ellerslie system being assembled in a shed or factory, that two skylights are visible in the roof top centre and top right. The 1949 aerial view shows the factory standing at that time had skylights in the long thin roof sections. I know this is probably a common sight in buildings of the time, however it does raise the question; is the photograph shown in the image of the Ellerslie system above, taken in a section of the factory shown in the 1949 aerial photo? If yes, then the Alice street Newtown factory pre-dates the founding of Automatic Totalisators Limited in 1917 and presumably started out as the factory of Totalling Mechanisms Limited, with the first project being the development and construction of the Ellerslie system that would commence operation in 1913. This would explain where the first three Julius Totes were developed. This would also explain why the company name Automatic Totalisators is painted on the side of the factory in the image at the top of this page, over a previous name. Finally the image of the Ellerslie system above, shows it inside a building that looks pristine and new. In this respect this photo is unique as all the other photos I have of this factory show it to be well used which adds credence to the possibility that the image above is taken inside the factory shown at the top of this page. Obviously there are lots of questions still to be answered. I will continue searching for answers! The "Next page" button below presents the first of three pages showing images from Harold Park Trots in Sydney and include an article from David Hamilton, who was the N.S.W Operations Manager of Automatic Totalisators Limited and as such, Harold Park was part of his domain. Interestingly, David's job as N.S.W Operations Manager would be the more modern version of Frederick's Job, State Tote Manager.